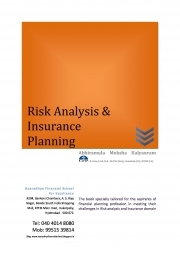 Description of "Risk Analysis & Insurance Planning (eBook)"
This book gives a detailed understanding on principles underlying in life and general insurance. It enables the student to understand and explain the need for insurance, the value of insurance to be taken by an individual on his personal life. It aids the student with in understanding and evaluates Human Life valuation, premium calculation and claim assessment. Abhiramula Moksha Kalyanram, CFPcm, B. Com, LL.B, M.A., M. Phil (Eco), Licentiate (LI), NCMP (L4), Has 14 years of industry experience as Consulting Research Analyst in Global Stock Investment markets, eloquent and diligent experience in delivering extempore Lectures in Financial Statement Analysis, Financial Risk Management, Tax laws, Financial Planning, Strategic Financial Management, Derivatives, Option Strategies, etc to MBA-Finance students that cater to the present industry demands. Global certification CFP (FPSB India) steering individuals towards meticulous personal financial planning to materialize all their financial achievements. Online SAP FI CO trainer to SAP - FI & CO career aspirants from USA, UK and Australia. Excellent communication skills to deliver optimum information to the trainees. Experience in evaluation of industrial standards in Financial Markets, researches and caters information that is in line with latest market trends. Reviews of "Risk Analysis & Insurance Planning (eBook)"